2009 interview from the archives with award-winning poet Natasha Sajé. Today's Write The Book Prompt is to draft an essay for the New York Times Modern Love column. Their submission guidelines include the following advice: "The editors of Modern Love are interested in receiving deeply personal essays about contemporary relationships, marriage, dating, parenthood...any subject that might reasonably fit under the heading Modern Love. Ideally, essays should spring from some central dilemma the writer has faced in his or her life. It helps if the situation has a contemporary edge, though this is not essential. Most important is that the writing be emotionally honest and the story be freshly and compellingly told." So draft an essay for the column. Set it aside for a week. And then decide what, if anything, you might want to do with it. Revise and perfect it and send it to the NY Times. Or take the material you put into that draft and turn it into a poem or a story or a new aspect of another work in progress. Or maybe you won't want to take it further. But the act of creating that first draft is your prompt for this week. Good luck with this prompt, and please listen next week for another! Interview from the archives with short story writer and guitar builder, Creston Lea, author of the story collection Wild Punch, published by Turtle Point Press. The last time I broadcast this interview with Creston Lea, I used his suggestion for a Write The Book Prompt, which was to eavesdrop on a conversation in a public place, and then use what you heard to write a scene with dialogue. This time, I'll recommend something slightly different, but also useful in writing dialogue. Using a digital recorder or a dictaphone, record a conversation between two people. Then transcribe the conversation exactly as it occurred. Keep all of their pauses and stutters and "ums" and repetitions. Now study a page of dialogue in a book. What might differ in the way that conversation actually sounds from the way that would best represent it on the page? What would you take out, what might you change or add? See if you can turn the conversation that you recorded into a scene that would be understandable--effortless for a reader to digest. 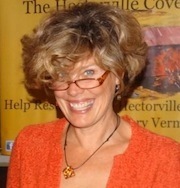 Vermont writer Tovar Cerulli, author of The Mindful Carnivore: A Vegetarian's Hunt for Sustenance, published by Pegasus Books. Vermont author Mark Pendergrast, whose latest book is Japan's Tipping Point: Crucial Choices in the Post-Fukushima World. Inspired by our guest Mark Pendergrast's interest in Japan, this week's Write The Book Prompt is to fold an origami crane. If you get stuck in your writing, or are simply wanting an activity that keeps you thinking, but not struggling, folding an origami animal might help. You'll still be engaged in a creative act, but you'll be following a set list of instructions, which might free the author in you to continue working away from the computer keyboard. Below are a few links to origami paper folding (all from the same site, which seemed easy to follow and not full of annoying ads). You can also print the Write The Book logo I've included below that for colorful folding paper. Or use a sheet from your recycle bin: maybe a rejected poem or scene can have a second life as a crane, a frog, or a flower.